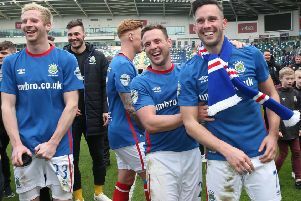 Linfield manager David Healy knows his side will be in for a battle when they face Cliftonville in the Danske Bank Premiership over the weekend. Former Northern Ireland international striker Healy accepts that the Reds will be hurting from their exit in the BetMcLean League Cup during the week to Dungannon Swifts. Barry Gray’s men were also beaten last weekend in the league by high-flying Ballymena United and the Linfield manager knows what to expect from a wounded Reds outfit. And the Blues manager was pleased with his side after last weekend’s victory against Institute at the Brandywell. “I was pleased in the end but we didn’t start the game that well after going a goal behind but you always have the concern after the poor performance the week before about how we would react to that,” said Healy. “Credit to the players, we got an important goal when we did and we got stronger and were better after the break. “We got the run of the ball in the second half when we got the right decision when the referee over-ruled the linesman. And Healy hopes his side produce another big performance against Cliftonville after a few poor displays before that win against Institute. “I get the frustration and the disappointments. But we got off to a good start in the league. We had a few difficult games but we got ourselves to the top of the table,” said Healy. “For a number of games we just haven’t been at it but we had been missing key figures and players have gone off the boil a little bit. “But it is important that we stick together and that the supporters give the players their full backing and we try and get the three points. “It is not going to happen every week but we will work hard and hopefully get another three points,” added Healy. And Cliftonville captain Ryan Catney is looking for the Reds to respond after their League Cup exit. “It was disappointing,” Catney said . “Dungannon came with a gameplan, but we should have taken our chances and finished the game off. “When it reaches penalty kicks it’s a lottery. “I missed my penalty, and that’s the way it goes. “That’s two defeats on the bounce now, and we have to pick ourselves up and go again. Some supporters have blamed the manager for the cup exit but Catney says the players have to accept responsibility. “The fans pay their money to come and watch us, so they are entitled to an opinion,” he said. “You can see their frustration at the ground, and then afterwards on social media. “They want to see good football and be entertained. “They want to see attacking football and goals, but sometimes it doesn’t work out like that. “They see the quality in our squad and expect us to turn it on in every game, and as players we have to step up. “We have good players at Cliftonville, and players who are big enough and ugly enough to accept responsibility and get on with it. “The manager bears the brunt of the grief and criticism, but the players are not delivering right now. “We have to pull our sleeves up and improve. “We have to do better. “And we need to play together as a team. “We want to make our fans happy. We go into every game feeling that way. “People know me. I hate seeing Cliftonville lose.